Crispy Parmesan chicken fingers for the kids; tasty wraps for the grown-ups. The base recipe is the same, so it's easy to please everyone! Add cheese to coating mix in shaker bag. Moisten chicken with water; gently shake off excess. Add 2 or 3 chicken tenders to shaker bag; shake until evenly coated. Place on baking sheet sprayed with cooking spray. Repeat with remaining chicken. Discard shaker bag and any remaining coating mixture. Bake 12 to 14 min. or until chicken is done. Meanwhile, prepare Dinner in large saucepan as directed on package, using the Light Prep directions and adding broccoli to the boiling water for the last 3 min. 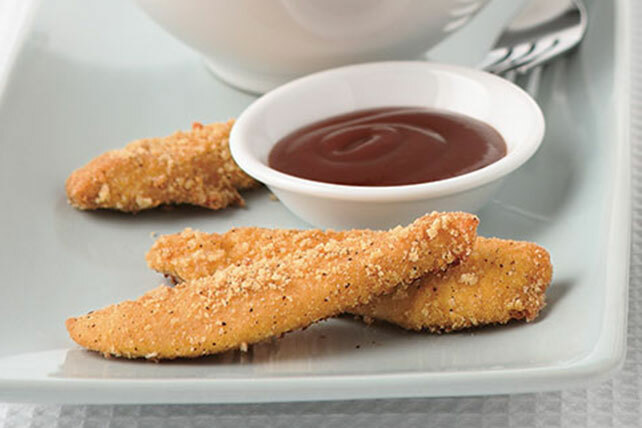 Serve Dinner with 2/3 of the chicken and barbecue sauce for dipping. Makes 4 kid servings. Place 1/3 of the chicken strips evenly on tortillas; top with lettuce and peppers. Drizzle with combined dressing and barbecue sauce; roll up. Makes 2 adult servings.